Bot domain empty ? Why ? Does not work on firefox, it returns Error: NOT_ALLOWED (in response payload), and does not redirect to data-auth-url. No visible information for user in browser. @ruslanmedia, i send /setdomain command, choose my bot but have error "Bot domain empty". What's wrong? Who know? How to set own button name ? Hi. Does anyone known how to use custom button (without text, only custom image)? Same "Bot domain empty" problem here. Start a conversation with the BotFather. Type "/mybots". Select your bot. Select "Bot settings". Select "Domain". Then type your domain name. You'll get a feedback message from BotFather like this: "Success! Domain updated. /help"
How about iOS and Android login with Telegram? It does not work, error 500. What version of PHP is necessary? bug! return string get -> "...username=Oxmix&photo_url=**https:/**t.me/i/userpic/320/Oxmix.jpg&auth_date=151..."
im trying to port this to python but hash_hmac fails. which fields should i include and in what order exactly? Does anyone know how to force a telegram to redirect a user to my page (without using a widget)? I tried to find the GET param as redirect_uri - unsuccessfully. But returns "Bot domain invalid" for a ".LIVE" domain (which is set on the bot using BotFather). What's wrong ? How I can send message to user if allow access to send messages? Any easy way to set a local development environment domain? How set localhost as domain?? BotFather return: "The message should contain one domain name." Unusable to me. It allows to add only one domain per bot. I couldn't even use it with multiple subdomains. If i set domain.com - i can use authorization from domain.com page, but cannot - from sub.domain.com page. How is it possible to test on localhost? I crated a bot and conected a domain to it. hi, how to use these files and code in wordpress? do i insert codes in which ones: theme file? or text widget in sidbar? i want to write code and dont want to use plugin. thanx. How start a conversation by bot? I tried a lot but failed. Works on firefox desktop , but don't work on firefox on an android device. hi. logIN is work. anybody know how to logOUT authorized user? any one can translate this to c#???? So the widget loads and then when you click it won't do anything. It is a pain, and not very reliable. This is in Safari. You can use 127.0.0.1 with port 80 to test it locally. For anyone who set their domain and still receiving a domain-related errors, note that you can't use ports inside domain names. BotFather will accept it, but the widget will not load. You need to use port 80.
anyone know how to allow only specific user can login using the widget? How to get also phone number on login? @Stajor Thank you a lot! login widget is not working in Telegram in App browser on iOS 10 and below. Did there anyone meet this issue? There are no 'photo_url' and 'username' fields in the parameters of the callback function. Did there anyone meet this issue? 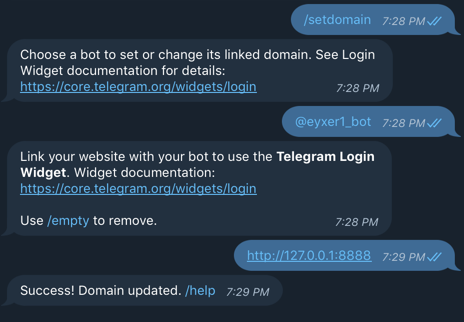 @param token: BOT_TOKEN e.g @"XXXXXXXX:XXXXXXXXXXXXXXXXXXXXXXXX"
After an user is logged in with Telegram Widget, it's possibile to use the bot to notify user somethings? The sample to you. Can someone tell me how to do authroize and get user information in the Android. Should photo_url be urlencoded to calculate hash? can i write a code in c# language for telegram bot ??? Ran into a problem. Or, rather a UX issue. iOS 12, trying to log in through built-in browser right in Telegram app. User clicks “login with telegram” button, enters the phone number, TG sends a message asking to confirm, but there are no notifications for this message, apart from a sound if it is on. Then a user needs to close the browser, open the chat with Telegram, press Confirm, then go back to the chat with a bot, open the web link again, click “log in with tg” button again, and after I had seen two outcomes. One when a user is asked the phone number again, which leads to the process loop and no ability to log in, unless user opens the web page in a safari tab (not built it safari). And two, when after clicking the login button, the user is actually logged in. The whole process in telegram app is kind of bad, I think. Any ideas on how to make it better?